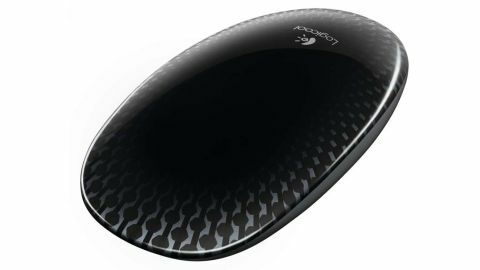 To say we weren't completely enamoured with Logitech's earlier M600 Touch Mouse would be a bit of an understatement, so it was with a slight hint of trepidation that we opened the packaging for the touch-responsive Logitech T620 Touch Mouse. We liked what Logitech was attempting with the M600, but a muddled design and cheap feel got in the way. But is the Logitech T620 Touch Mouse any better? The good news is that for the most part the Logitech T620 Touch Mouse is a big improvement on its predecessor. Gone is the hollow feel of the M600 that gave it a rather cheap and brittle feel. The new mouse is by no means heavy, but it feels better built. The Logitech T620 Touch Mouse also has a more responsive touch interface, and backed up by Logitech's own software you can configure your own gestures to navigate Windows 8 with. So a quick double-tap of the mouse with a single finger brings up the Start screen, flicking from the left-hand side of the screen (or in this case the mouse) switches between apps, while flicking from the right brings up the Charms menu. Pinching to zoom in and out is still absent, however. The Logitech T620 Touch Mouse is priced at £59.99/AU$89.95/US$69.99, putting it above the Logitech T400 Zone Touch Mouse in the brand's recent touch-sensitive range of mice. Left and right button clicks are much more accurate considering there's no separate buttons to speak of, and overall the Logitech T620 Touch Mouse is a big step up from the Logitech M600 Touch Mouse. It's not perfect - double-clicking can be a touch hit and miss - and it won't be for everyone, but it's got some nice features and a lovely design.